Check out Subhash K Jha's Bollywood Buzz. 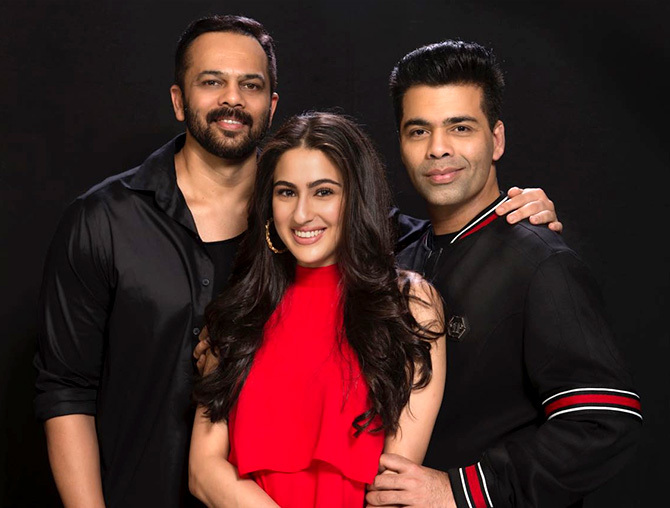 IMAGE: Rohit Shetty, Sara Ali Khan and Karan Johar. What is not known to the world is that the role had to be tweaked drastically before Sara stepped into it. "Initially," confides a source, "Karan was supposed to launch Sara, but he couldn't find the right vehicle. So he allowed her to do Abhishek Kapoor's Kedarnath." "When that project faced a roadblock, Karan offered Sara Simmba," the source adds. "But that film was completely Ranveer Singh's, so Karan asked Rohit to modify the script to make more space for Sara." "Karan didn't want Sara to debut as a prop." 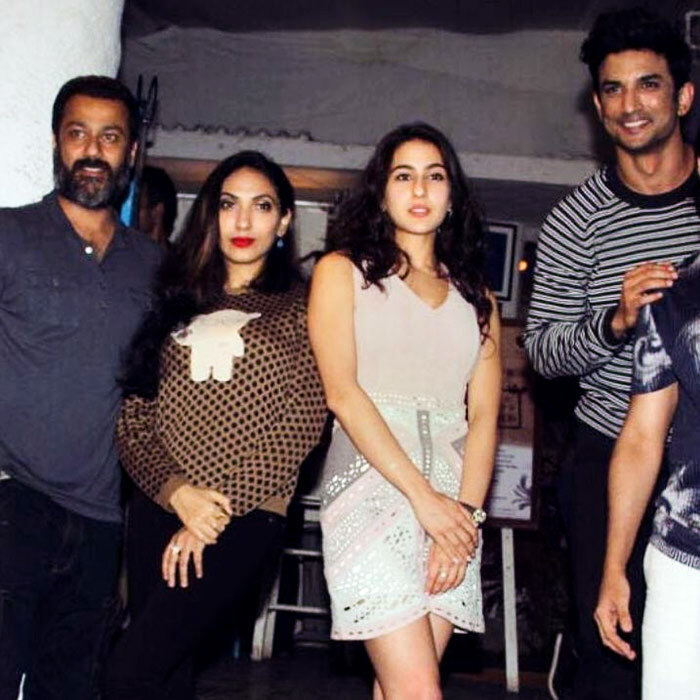 Meanwhile, Producer Prernaa Arora's tussle with Kedarnath Director Abhishek Kapoor appears to have ended. Ronnie Screwvala's RSVP films has bought Kedarnath from Prernaa's KriArj Entertainment and the other co-producers, namely Balaji Tele-films and T Series. KriArj was paid Rs 17 crore (Rs 170 million) for their investment in the film so far. Refusing to divulge details of the financial transaction, Prernaa tells me, "The so-called fight is over, though it was never initiated from our side." "We were trying to do the right thing, but unfortunately, things did not work out," she says. "Before matters could get ugly, it has been sorted. We have gladly let the film go." "We wish Kedarnath all the best." Prernaa is now concentrating on her forthcoming films. "The first one out is Shree Narayan Singh's Batti Gul Meter Chalu. We're very proud of this film and are sure it will be as influential as the director's Toilet: Ek Prem Katha." Shah Rukh Khan started the ladies first trend in a film's redits. For the past three years, the superstar has insisted on his name appearing after the leading lady in the credits. Varun Dhawan has gone a step further in his October. His name appears after his leading lady Banita Sandhu and Gitanjali Rao, the actress who plays Banita's mother. "It is something I felt was right," Varun says. "Banita plays Shiuli, the character around whom the film revolves. Gitanjali Rao, as her mother, deserves just as much prominence. They are the stars of the film." 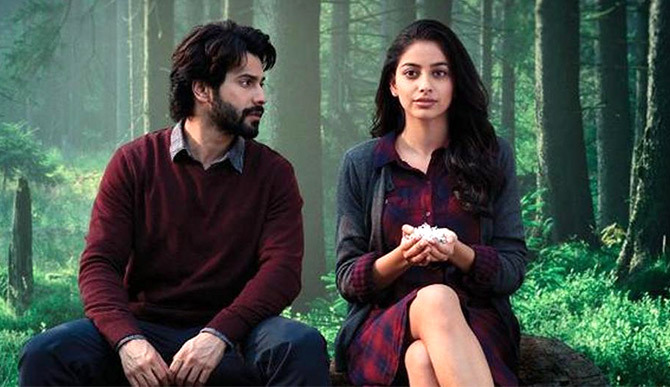 "The other stars of October are Screenwriter Juhi Chaturvedi and Director Shoojit Sircar," Varun adds. "If I had my way, I'd have placed my name after their credits as well. They are the real stars of October." Varun is not making token gestures in support of women. "I respond to all that is happening in the country, especially atrocities against women and children, which are intolerable to me and to any conscientious Indian," the actor says. What is Varun telling Banita? Pose like Surveen this summer!